Tagged under Dragon Ball, Husbando, Spiky Hair. Goten is the son of Goku and Chichi, making him half Saiyan and half human. His older brother is Gohan. Despite being part human, both sons can transform into Super Saiyans. As a child, Goten looks strikingly like his father, although he eventually grows to look more like his brother. Goten's girlfriend is Valese and his lifelong best friend is Trunks. 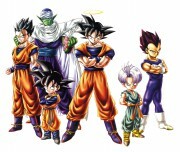 Note: Goten's various forms are under their respective tags. This tag only includes his non-Saiyan form.